Thus, I am expected to describe bare facts only, as my colleagues want it. So, I will try… but we were not made of wood… not to say of stone. Prisoner 4859 was a volunteer for Auschwitz. We will tell you his story, as others have tried to erase him from history. His heroism was largely unknown for 50 years, but he is truly a hero. Witold Pilecki – codenames; Roman Jezierski, Tomasz Serafiński, Druh, Witold – was a founder of the Secret Polish Army. He was born in Olonets, Karelia, northwest Russia, as a descendant of Polish patriots. He was raised in a patriotic manner as well. In 1914 he entered Scouting, which was then a forbidden organization, outlawed by the Russian State. In 1918 he sneaked into Poland, a country that just got back its independence after 123 years of occupation. The Young 2nd Republic of Poland didn’t have much time to rest. In 1919 a Polish-Soviet War started and as an 18-year-old man, Pilecki had to defend his country. As a cavalryman, he participated in the Battle of Grodno, the Battle of Warsaw, and the Żeligowski’s Mutiny. For his actions during this war, he was awarded the Polish Cross of Valour, twice. In 1921, when the war was over, he married and became the father of two children. He rebuilt his family estate and started painting as an amateur. Perhaps he thought his days of military service were over. 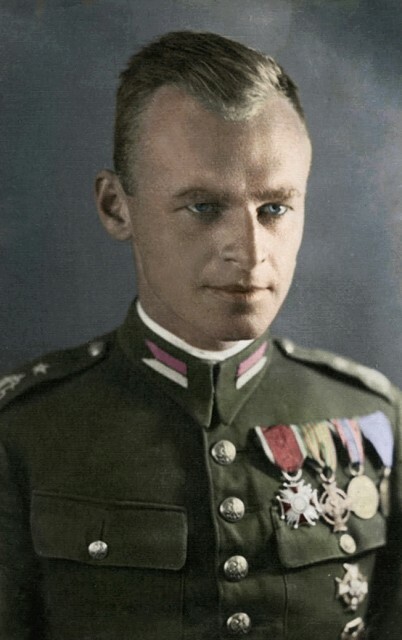 Pilecki in a colorized pre-1939 photo. On September 1st, 1939, the Third Reich started World War II by invading Poland. The Polish Army was defeated in weeks, and the last battles fought by Pilecki’s unit were as a partisan unit. Pilecki, with two others soldiers, then founded the Secret Polish Army, one of the first underground organizations in Poland. 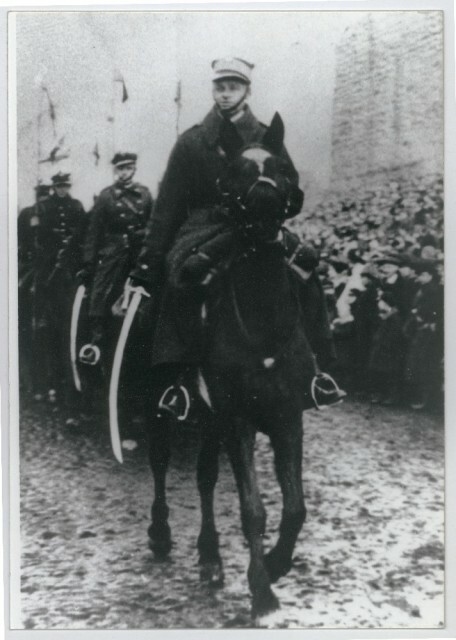 Pilecki during a military parade. Photo Credit. In 1940 Gestapo arrested a number of members of his resistance group and sent them to Auschwitz. Thanks to this Intel, this camp became a matter of interest to the whole organization. At this time, not much was known about German Concentration Camps. He figured that if he was arrested, he would probably be incarcerated in Auschwitz. Pilecki presented the plan to his superiors to enter Auschwitz Concentration Camp, gather intelligence from the inside and organize inmate resistance. The others supported his plan, and it was decided. On 19 September 1940, Pilecki deliberately let himself be caught during a German razzia in Warsaw, along with 2,000 other civilians. After two days of detention where prisoners were beaten and tortured, he was sent directly to Auschwitz Concentration Camp in Oświęcim. As inmate 4859, despite bouts of stomach ailments, typhus and pneumonia, lice infestations, backbreaking toil hauling rocks, extremes of heat and cold, and relentless hunger and cruelties at the hands of German guards, he formed an underground resistance group, the Union of Military Organization. Keeping up the spirit and morale of inmates. Passing news from outside world to other inmates. Gathering food and clothes in secrecy and sharing it. Passing intelligence outside the KZ Auschwitz. Preparing divisions to take over the camp during a possible attack from the outside. ZOW was designed as a system of groups of ‘five.’ The first ‘five’ was the highest command of the organization. Members of ZOW had to earn an utter trust of Pilecki to be able to become part of the organization. Of course, the name ‘five’ wasn’t precisely, sometimes a single group had more members. According to Pilecki’s, every ‘five’ had no idea about other groups and was convinced that they were the top of the entire organization. They developed on their own and built new branches of groups under their supervision, as far as they could. ZOW provided the Polish underground with invaluable information about the camp. From October 1940, ZOW sent reports to Warsaw, and beginning in March 1941, Pilecki’s reports were forwarded via the Polish resistance to British Government in London. 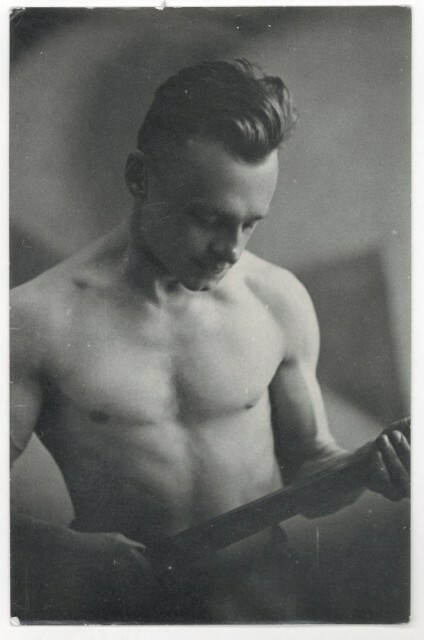 Young Witold Pilecki holding a cavalry saber. Photo Credit. From 1942, his reports were broadcasting using a radio transmitter that was built inside the camp (it took seven months to create such device with smuggled parts), including details on the number of arrivals and deaths, and condition of inmates. ‘Witold’s Report’ was the first comprehensive account of the Holocaust from a firsthand witness and was a principal source of intelligence on Auschwitz for the Western Allies. Many didn’t believe that this was the reality in occupied countries. And it’s hard to imagine how hard was even to stay alive in the camps, with 7,000 Nazi SS guards, not to mention building a resistance network, organize escapes and send such valuable information outside. Meanwhile, Gestapo sniffed out the traces of the ZOW, killing many of them. Pilecki decided to break out of the camp with the hope of convincing the Home Army leaders personally that a rescue attempt was a valid option. On the night of 26/27 April 1943, Pilecki and two others inmates escaped. 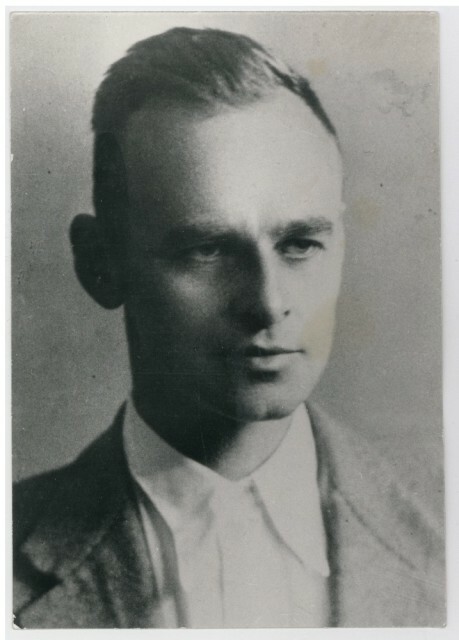 Photo of Witold Pilecki, after war. Photo Credit. Pilecki made contact with Home Army units a few days later. A month after his escape he reached Warsaw (200 miles from Oświęcim) and met the Home Army intelligence department. Yet the plan of attacking Auschwitz and capture it wouldn’t have been a success without help from the Allies. Pilecki’s detailed report estimated that, by March 1943, the number of people gassed would have reached 1.5 million. The underground army in Poland didn’t have the numbers to attack the camp, so they asked the Soviets to participate in this action. However, the Russians showed no interest in joining forces with the Home Army and ZOW to liberate the camp. On 23 February 1944, Pilecki was promoted to cavalry captain and joined the secret organization ‘NIE.’ Their goal was to prepare resistance against a possible Soviet occupation. History shows they were right, and after 1945 Poland would fall under Soviets rule. These ‘Cursed Soldiers’ were active to 1963 when the last known soldier was killed in an ambush, almost 20 years after World War 2 ended. On 1 August 1944, the Warsaw Uprising broke out. It was the largest offensive that was undertaken by any resistance movement in Europe during World War II. Pilecki, hiding his rank, also fought there (Soldiers of ‘NIE’ were forbidden to risk their lives). After two months of fighting in the Polish capital, the Uprising was crushed by the Germans. It was a disaster, with more than 200,000 deaths, 80% of the city was destroyed, and Pilecki ended up as a POW. The Nazis didn’t know who he was, so he survived the war. Germany surrendered on May 8th, 1945, which resulted in the liberation of the prisoners. It wasn’t the end of Pilecki’s struggle for a Free Homeland. In Italy, 1945, Pilecki wrote his final report on Auschwitz, 100 pages in total. Here is the link to this report. Pilecki met there Władysław Anders, commander of The Polish 2nd Corps, a major tactical and operational unit of the Polish Armed Forces in the West, which participated in the Italian Campaign, captured Monte Cassino and later on fought on the Gothic Line and in the final spring offensive. It appeared to be clear that Soviets didn’t intend to leave Poland, and the prospect of free elections seemed unlikely (Stalin’s promise from Yalta Conference). In October 1945, Pilecki accepted yet another undercover assignment – to gather intelligence about growing Soviet atrocities and send it to Polish government-in-exile. This mission marked him as an enemy of the state, even though the information he collected wasn’t officially top secret. In 1946, any hope that Poland would be free melted away. The remaining active resistance soldiers in Poland were ordered to either escape to West or return to their normal civilian lives. Pilecki received such order as well and declined it. 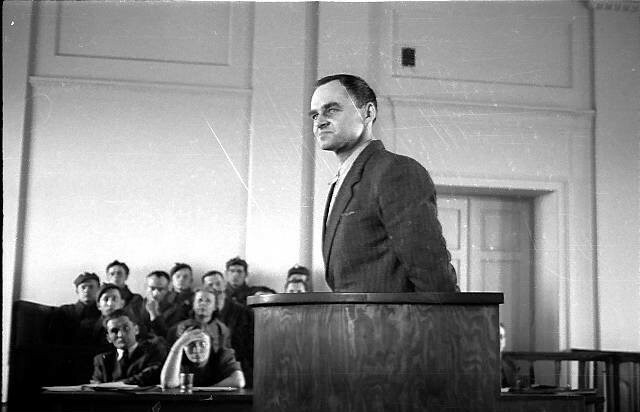 Pilecki in the court, 1948. The sentence was obvious. All prisoners were either executed or imprisoned. He was accused of illegal border crossing, use of forged documents, not enlisting with the military, carrying illegal arms, espionage for General Władysław Anders, espionage for “foreign imperialism” and planning to assassinate several officials. 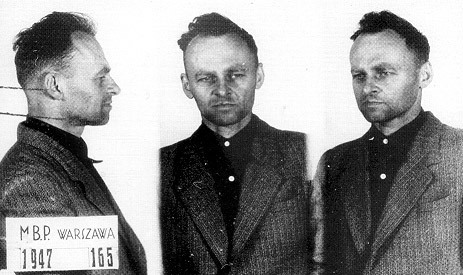 Photos of Pilecki from Mokotów prison, 1947. Pilecki denied the assassination plans and pleaded guilty to the other charges, but he called his actions legal and in the true interest of Free Poland. He was sentenced to death and executed with a shot to the back of the head on 25 May 1948. No one knows where his body is now. Witold’s symbolic grave on military cemetery in Powązki. Photo Credit. For decades, his story was unknown and supressed, due to Soviet censorship at the time. They couldn’t speak about his anti-Nazi actions without telling of his anti-communist activities too. 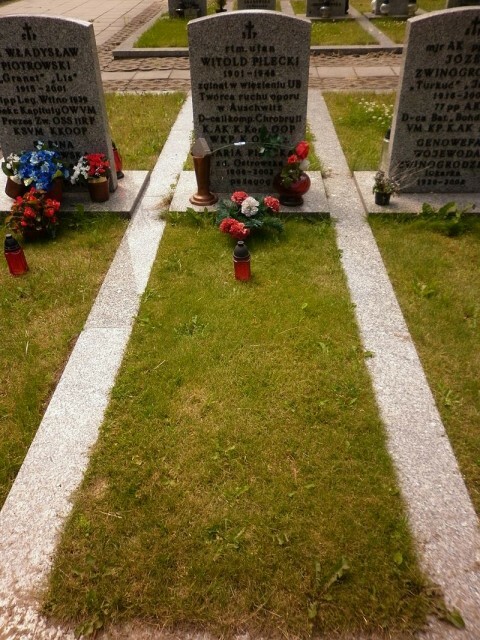 In 1990, Witold Pilecki was finally absolved of all charges. The first publication of Witold’s Report took place in 2000, 55 years after the war. Previously classified or suppressed documents about Pilecki became well-known. A movie about his story is being developed. It is called ‘Operation Auschwitz’, and it is slated for release later in 2016. His Soviet prosecutor, Czesław Łapiński, died on the way to the hospital, before his trial for judicial murder. 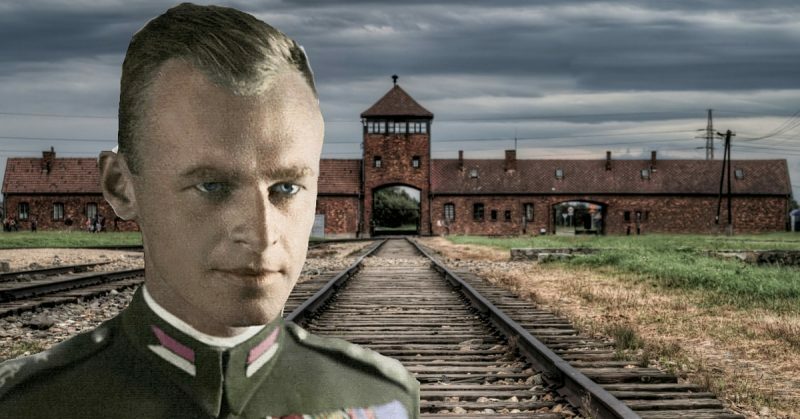 Pilecki’s comprehensive 1945 report on his undercover mission at Auschwitz was published in English for the first time in 2012, under the title The Auschwitz Volunteer: Beyond Bravery.